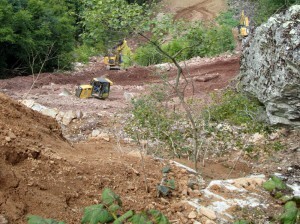 Pipeline construction over steep Appalachian mountains creates significant runoff and slope-failure problems. 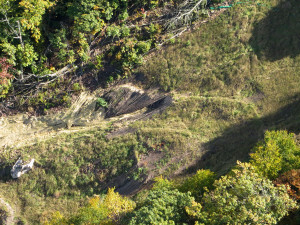 Dominion Transmission, Inc., for example, was fined in 2014 for serial slope failures at one of its pipeline projects in West Virginia. In that case, as in others, the difficulties associated with construction in extreme landscape have been compounded by noncompliance, relaxed standards, and ineffective regulatory oversight. 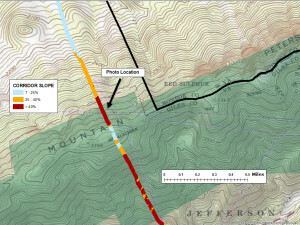 Our ongoing study of a relatively small (12-inch diameter) pipeline project over Peters Mountain in the Jefferson National Forest in Giles County, Virginia, provides another case in point. The Peters Mountain pipeline project was the focus of the DPMC’s Case Study Number One. 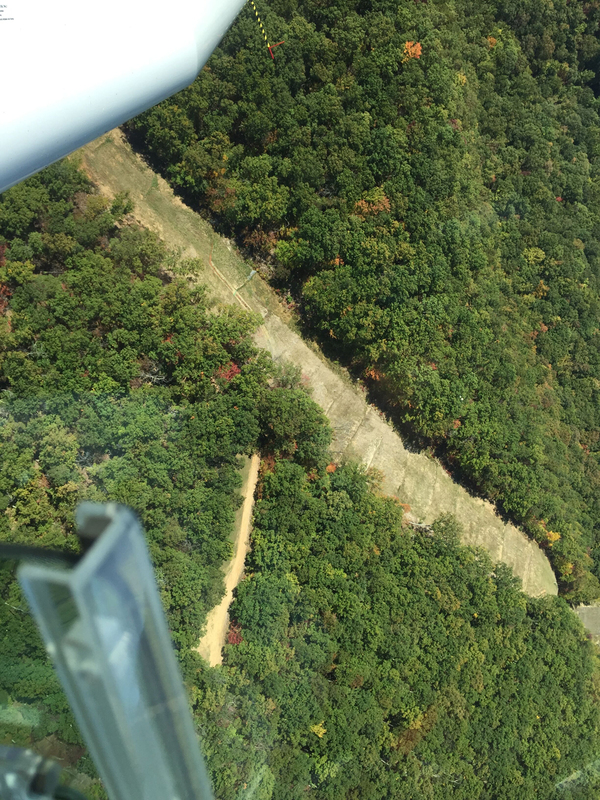 Our Pipeline Air Force flew over the now “restored” construction corridor on October 8th. The following letter, requesting investigation of slope failures and access to documents, has been submitted to the Virginia Department of Environmental Quality. Additional information will be posted as responses are provided and documents are obtained. As you may know, the Dominion Pipeline Monitoring Coalition is conducting case studies of pipeline construction projects that are subject to regulatory oversight by the Virginia DEQ. We obtained new aerial photography of this project yesterday, October 8, 2015. 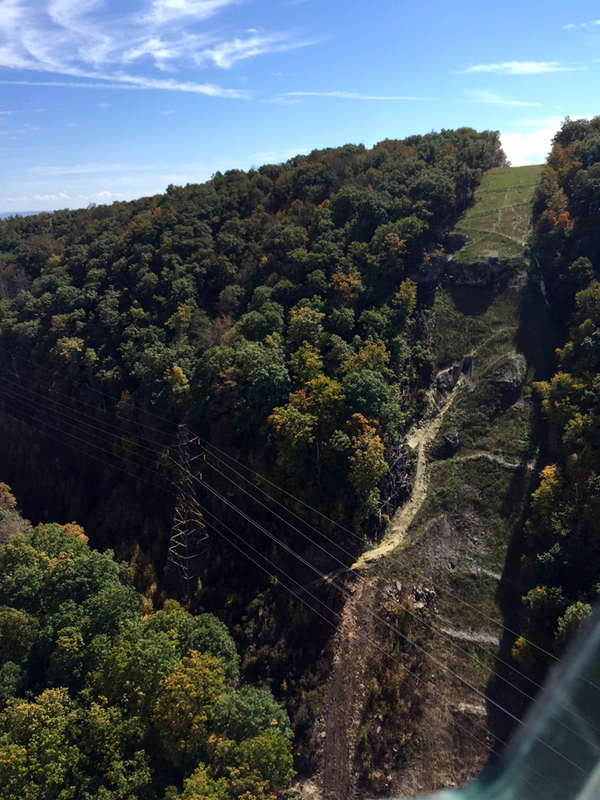 The attached photos, obtained for the western slope of Peters Mountain, in the Jefferson National Forest, reveal significant and ongoing slope failure on a steep (slope > 40%) section of the corridor. Based on the photos it appears that this is a known restoration problem and that efforts to stabilize the slope with some sort of landscape fabric have not been successful. It also appears that a significant amount of surficial material has either slipped or washed downslope. 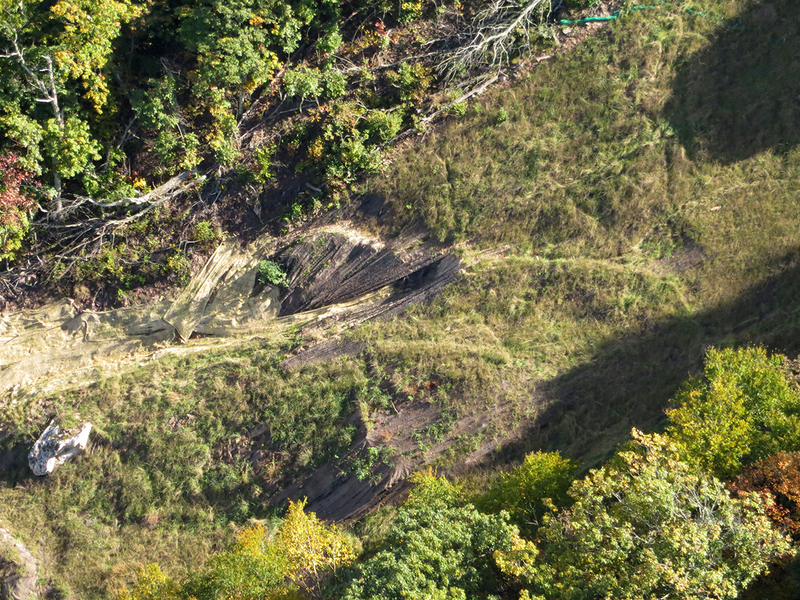 This observed slope failure cannot be in compliance with Virginia Erosion and Sediment Control or Stormwater Management requirements. We also point out that water interceptor diversions were not properly installed during the construction phase of this project. Also, the DEQ granted a variance to the open trench limitations specified in the state ESC regulations. Moreover, the DEQ made no on-site inspections of this project during construction. This apparent noncompliance, relaxation of standards, and lack of regulatory oversight may have contributed to the present restoration failure and slope instability. 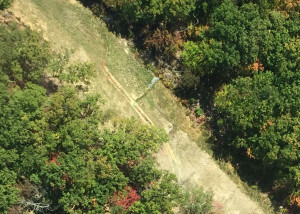 Thus we ask you to investigate the slope failure problem at the Columbia Gas – Celanese pipeline corridor, and we would appreciate obtaining copies of all information, documents, reports, photos, notices of violation, etc. related to the problem. Finally, as a follow-up to previous information requests, we would like copies of all documents in the possession of the DEQ related to the project in question, including inspection reports, enforcement actions, permit applications, variance requests, and related correspondence. This is a Freedom of Information Act request. This request applies to the period of February 1, 2015 to the present date. Digital copies are preferred. Please advise if the cost for providing the requested information will exceed $150. Failed restoration work, western side of Peters Mountain, Jefferson National Forest, October 8, 2015. Location map for slope failure photos in relation to slope steepness classes for pipeline corridor. 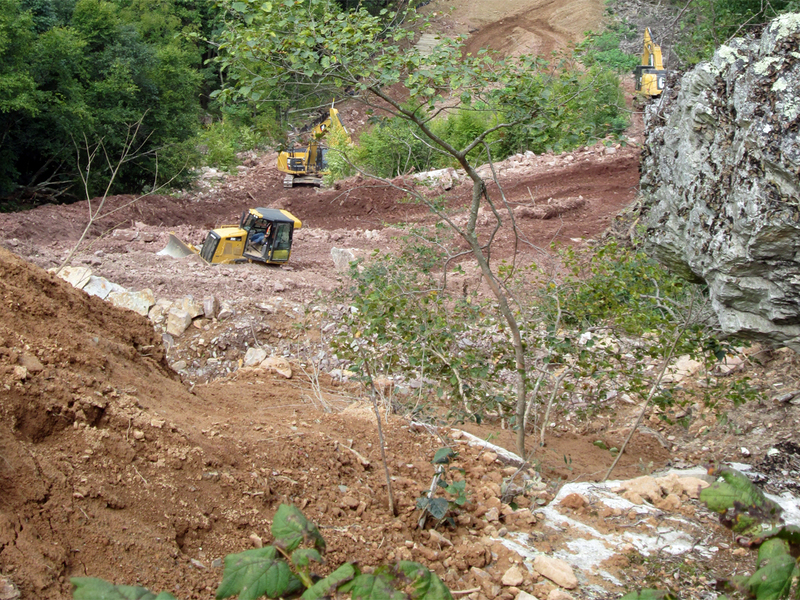 Pipeline corridor excavation, western side of Peters Mountain, Jefferson National Forest, 2014. Reclaimed pipeline corridor, eastern side of Peters Mountain, cross-corridor drainage and access road, October 8, 2015. 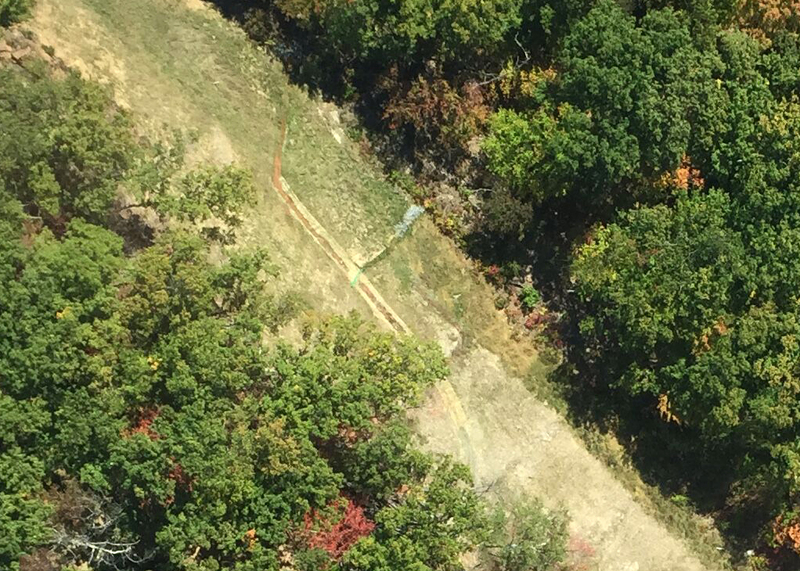 Reclaimed pipeline corridor, eastern side of Peters Mountain, close-up of cross-corridor drainage, October 8, 2015.